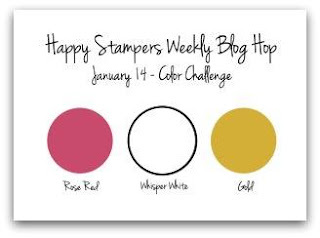 This week's challenge is a Color Combo Challenge: Rose Red, Whisper White, Gold. So again, we can use any layout, any stamp set, but use these colors. Today I'm featuring the Remarkable You stamp set and the Love Blossoms Designer Series paper from the Occasions Mini catalog! Can you find my little touch of Gold? The designer series paper pattern features Rose Red and Blushing Bride....so I just had to add the Blushing Bride Glimmer paper again!!!! And...did you notice I used the sketch from last week again! Here's a few pictures from different angles so you can see the depth and dimension of the card. I stamped the flowers in Staz-On ink and used the blender pen for watercoloring. 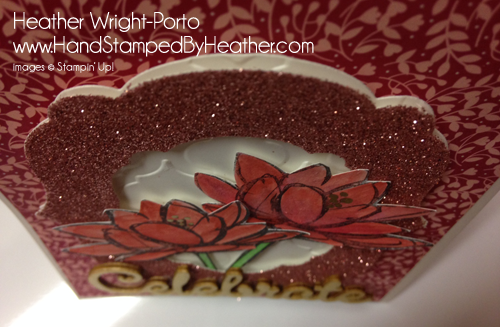 Then I cut out the flowers and adhered to the card front panel with Stampin' Dimensionals. 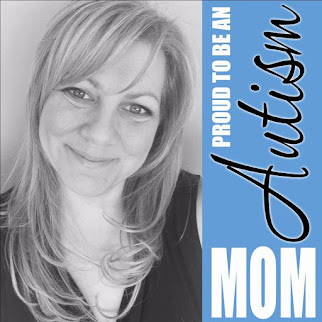 To create the focal point I used two different Label framelits to create the "frame". I also embossed a piece of Whisper White using the Modern Mosaic Textured Impressions folder. And then used the Labels framelit on top of it to cut it out, to be placed behind the shimmery frame. I used the gold pen to add a little touch of gold to the flowers. Want More Ideas From The Occasions Catalog? 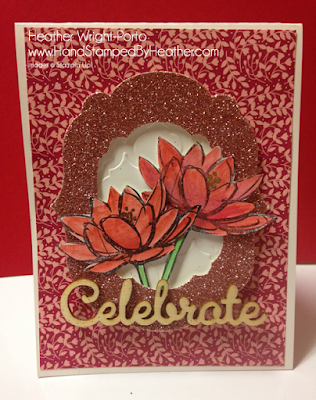 The come on over to Stamping and Blogging. 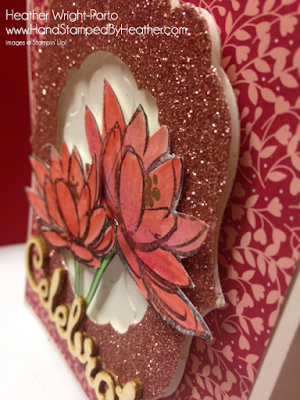 We have a new card class featuring the beautiful Botanical Blooms die cuts, papers and more. AND the cards can be done in 10 minutes or LESS! Very pretty framing of your focal image Heather. Your fussy cut flowers are amazing! So pretty Heather. I love your choice of flowers. They just pop from the frame you created. Beautifully done Heather...love the flowers in front and the touches of the Gold Marker. Great depth and color!